The U.S. wastes vast quantities of resources on the War on Drugs with nothing to show for it but counterproductive results. Drug use today is as commonplace as ever, despite the cumulative expenditure of many billions of dollars on law enforcement and judicial costs. We have ceded drug markets to organized crime, tolerated corruption of public officials, incurred the human and economic costs of millions of life-years wasted behind bars, and subjected users to impure and dangerous forms of contraband. And in the process, we have encouraged addiction, disease and death while dedicating relatively few resources to programs that might have helped these troubled souls. These facts are taken from this discussion of the effects of Portugal’s drug policies, this Wikipedia entry, and the 2018 Portugal Country Drug Report from the European Monitoring Centre for Drugs and Drug Addiction. As a fiscal matter, some of the strongest objections to Portuguese drug policy have to do with the granting of public aid to drug addicts, who usually have themselves to blame for their predicament. And in fact, decriminalization was accompanied by a decision to transfer funds associated with enforcing drug laws and punishing offenders into treatment and rehabilitation of addicts. This includes subsidized housing and jobs as well as loans for certain productive efforts. These strike me as better uses of public funds than a drug war, and by all accounts the programs have been successful. And to the extent that recovered addicts are able to lead productive lives, they add to the strength of Portugal’s economy. In an ideal, classically-liberal order, privately-funded lifetime insurability would avoid the need for public funding of these programs, but that is a reform for another day. Like any prohibition of activity in which a plurality engages, laws against drug use are generally ineffective and counterproductive (also see here). Portugal’s enlightened approach to drug policy is praiseworthy, sets a great example for other countries, and might be more politically feasible than full legalization. However, as long as there are any penalties for drug possession, there will be a wedge through which rents can be extracted by the underworld. Full legalization would do the most to attenuate crime and other risks associated with drug use, and it would also maximize the resources available to address problems faced by addicts and drug-dependents. Note: the poster above is from 2014… the numbers are larger now! Wanna Help People? 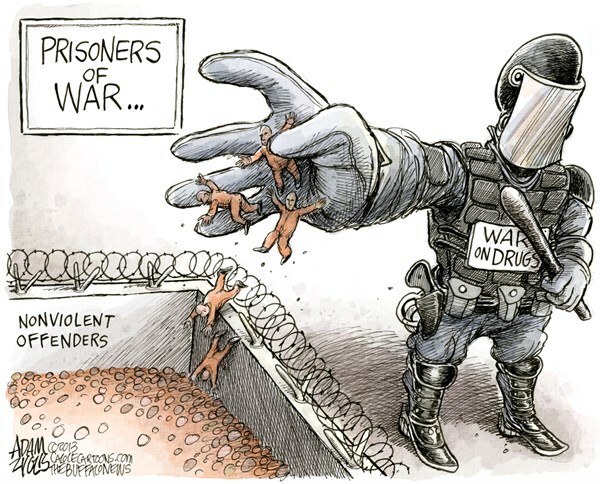 End the Drug War! We’re taught that illegal drugs are a scourge on humanity, that their use is immoral and that legalization is out of the question. Yet far more of us, our friends, and our loved ones have been intimate with the destructive effects of alcohol and dependency on legal drugs than on illegal drugs. Pharmacologically, the “worst effects” of illegal drugs are no worse than the well-known effects of alcohol abuse. 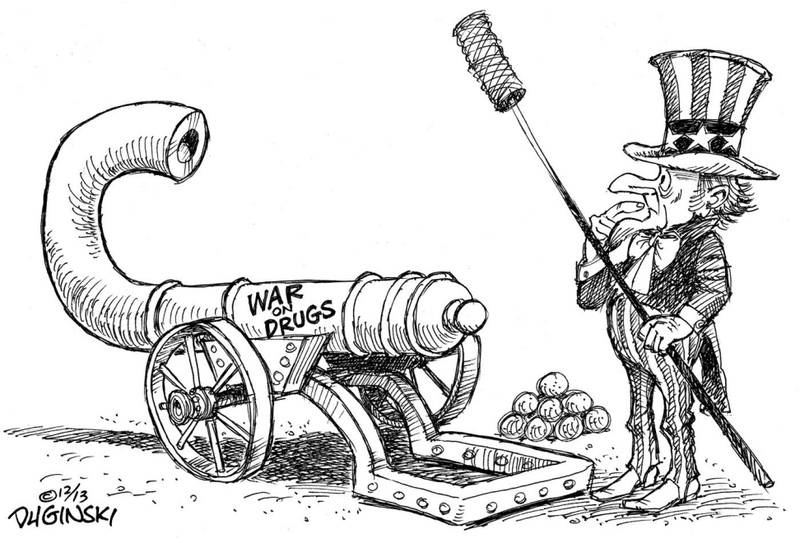 In fact, the “worst effects” have more to do with prohibition than with the illegal drugs themselves. Rules are codified into law successfully when widespread agreement exists among the citizenry that a rule is sensible. This should trouble drug prohibitionists: a substantial proportion of the population has used illegal drugs as adults, indicating a strong lack of consensus that recreational drugs should be illegal. For this reason alone, drug prohibition is and always will be ineffectual. Innocent people become casualties of violence instigated by gangs and sometimes by police actions. 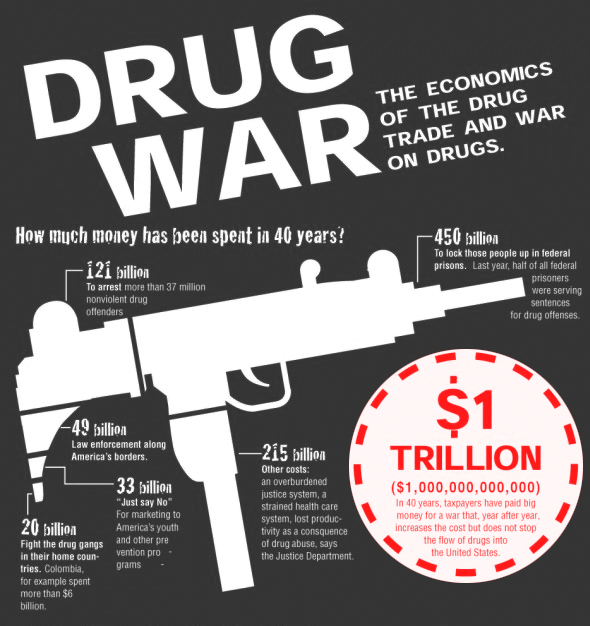 The drug war creates greater danger for users. In “Prohibition Kills“, Jacob Sullum discusses four recent examples of more dangerous and even deadly drug variants that have been developed as a direct consequence of prohibition. Friedman is often quoted as saying that crack cocaine was a direct consequence of the drug war. Sullum asks whether this could be an intentional strategy by drug warriors for discouraging consumption. I’m not convinced they are quite so nefarious, but it’s something to ponder. More dangerous varieties of drugs would not vanish overnight if drugs were legalized, though the incentive to develop them would diminish. Of course, if legalization brings prices and risks down, as we’d expect, it would encourage greater recreational use. That should not be viewed as a “bad” any more than better access to cocktails at happy hour. Abuse is unlikely to increase because problem users tend to be undeterred by prohibition. And as unsavory as an increase in recreational drug use might seem to the temperance faction, it would still represent only a small fraction of the real costs of ruined lives imposed by prohibition and the drug war. Legalization would bring other complexities, as Colorado’s experience with marijuana shows. For example, rules with respect to driving under the influence must be updated, as well as laws prohibiting possession by minors. Colorado went so far as to regulate packaging, and tax treatment of the drug trade will stoke debate, as governments will hope for something of a tax bonanza. But the more that government attempts to regulate and tax drugs, the more that problems similar to those associated with drug prohibition will persist, albeit on a smaller scale. Economically, legalization should eliminate a burden on taxpayers. It would free up law enforcement resources to battle real crime and should make more funds available for treatment programs. It would also help to improve lives and safety in inner cities and other areas ravaged by black market drug trade and the violence it foments. And of course, legalization would put an end to the ruin of lives caused by the arrest of individuals for victimless crimes. Prohibition of drugs belongs to a larger class of social problems brought on by efforts to bring the police power of government to bear on private behavior. I already mentioned that alcohol prohibition had similar consequences. To lesser degrees, similar harmful consequences are associated with laws against prostitution, large soft drink containers, sugary foods, and practicing almost any commercial art without a license. The same can be said for price regulations like rent control and the minimum wage. The former has led to the destruction of vast quantities of housing; the latter harms low-skilled workers along non-wage dimensions and makes it difficult for unskilled workers to gain valuable experience in the job market. Government interference with individual liberty might well restrain certain activities deemed “undesirable” by busybodies, but it it also leads to higher prices, greater risk, black market activity, violence, unnecessary legal actions against individuals, and greater expense for society.